Many of us tend to look forward to the summer months, however, that’s not the case for all of us. For those who suffer from acne, the summer can seem like a free-for-all for breakouts. The soaring temperatures and relentless humidity causing you to sweat excessively can make regular skin-care routines seem pointless and the acne can be quite embarrassing. If you have acne prone skin, here’s what you need to know to maintain clear skin and keep your confidence this summer. Two showers a day can keep the acne away! In July and August, the sun is scorching most of the day so it’s hard to stay cool 100% of the time, especially if you must go outside. The smallest amount of sweat can cause your pores to clog, especially where your clothing is tight like your underwear. Take a shower right before bedtime to be sure that your skin is nice and clean before bed preventing the oil from absorbing in your sheets and being on your skin overnight. No matter if you’re an avid hiker, biker or just like to enjoy walks in the beautiful sunshine, it’s important to wash your gear after each use. Your bike helmet strap can cause acne where it touches your skin since it carries acne-causing bacteria if not washed. Be sure to wash your bras after each use as well since they absorb your sweat. You don’t want to put it back on after sweating in it all day. That’s a great way to get acne on your back and chest. While chlorine kills bacteria, it is also known to dry your skin out which can also cause breakouts. We all know that oil causes breakouts but not having enough oil can cause breakouts too as the dead skin cells clog pores as well. If you can’t shower right after swimming, try to at least splash fresh water on your face. 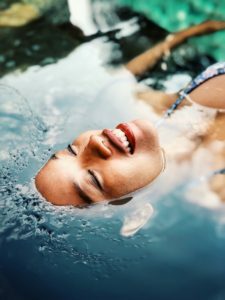 If you’re an avid swimmer, you may want to consider coming in for our micro-resurfacing treatment. This treatment will help get rid of all the dead skins cells giving you a clean and clear look. Many of us use cleansers that have more oil in them during the winter because of the dry, cold air. You may want to switch to a cleanser that has less oil in it since our skin naturally produces oil in the heat. You may also want to get a lighter moisturizer to help prevent your pores from getting clogged. If you’re not sure which skin-care products to use, we recommend Image Skincare and would be happy to help you pick which is best for you. There are many things that we put in our bodies that cause inflammation. Sugar and dairy are two more common ones. To see others, take a look at 8 Foods An Inflammation Expert Won’t Touch. A good way to reduce inflammation is to reduce your intake of inflammatory foods. You can also take supplements or stimulate your liver with the use of herbal teas. Some teas like dandelion tea have anti-inflammatory properties that also help your liver reduce toxins in your body which can lead to breakouts. If you take these tips into consideration this summer, you’ll be sure to reduce the number of breakouts you have if not prevent them all. If you’ve had acne prone skin in the past and want to get rid of any scarring that is making you feel self-conscious, we have micro-needling which can help with that also. Come on in for our free consultation and we’ll help you determine which treatments are best for your skin!